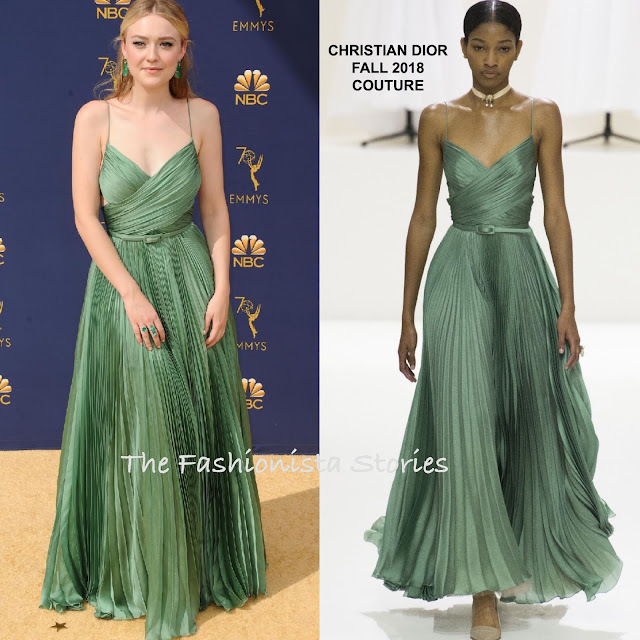 Dakota Fanning is presenting this evening(September 17th) at the 70th Primetime Emmy Awards at the Microsoft Theater in LA. Given Dakota's red carpet history, I am very surprised that she is not wearing Prada or Miu Miu. Instead she opted for a CHRISTIAN DIOR FALL 2018 COUTURE green plisse pleated dress, featuring a crisscross bodice, a cutout back and a belted waist. While the length is different on the Dakota, I do like this is a lovely look which she teamed with matching LORRAINE SCHWARTZ jewelry. What do you think of Dakota's look?